The National/International Mission Committee (NIMC) is currently comprised of Church members, Deacons, Elders, and our associate pastor, Rev. Emily Campbell, who all have a passion for mission activities beyond the local community. NIMC welcomes additional church members who want to get involved to join our group. The goal of the National / International Mission Committee (NIMC) is to provide handson mission support for both national and international mission activities, and to increase our Church’s involvement in these activities through both group and individual actions. We also work to provide handson opportunities for service that encourage our Church family to share the talents that they have received from God with individuals and groups in need. Over the past few years, NIMC has supported two large group mission trips to an orphanage in Mexico, two individual trips to Haiti, and two group trips to Malawi. In addition, our group has supported disaster relief efforts in Pakistan, Japan, Ohio, Kansas, Mexico, and the Gulf Coast (Katrina) through Presbyterian Disaster Relief, and has led Operation Christmas Child to provide Christmas shoebox gifts to needy children around the world. NIMC was instrumental in developing a 10-year Covenant Partnership between Mtenthera CCAP (Malawi, Africa) and First Presbyterian Church of Plymouth (FPCP). 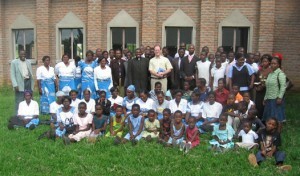 The partnership agreement was signed in 2010, and since that time, we have provided support for a water well and supply system, local hand-dug wells, over 700 bibles and hymnals to be distributed to individual families in their native Chichewa language, and funding for HIV and AIDS education programs. For more information on news and events relating to our Malawi partnership, go to the Malawi News & Events page. Marion Medical Mission is an ecumenical, Christian, front-line, hands-on, volunteer, non-profit organization that responds to Christ’s call to serve by working hand in hand with God’s people in Africa. They show the love of Christ through projects that directly impact the African people, stressing self-help and sustainability. Specifically, Marion Medical provides simple shallow wells in rural communities to provide a safe, reliable source of clean drinking water. FPCP supports Marion Medical Mission through annual financial contributions for operations, fundraisers for shallow well construction and by sending volunteers to join installation teams in Africa. Malawi Matters Inc. is a 501(c)(3) not-for-profit organization whose mission is to develop and facilitate HIV and AIDS education with the people of Malawi, Africa. By connecting agencies and organizations and using hands-on techniques grounded in Malawian culture, they believe that Malawian youth and adults can find solutions to the HIV and AIDS crisis as well as improve and enhance the quality of life in this economically impoverished, but spiritually rich nation. FPCP supports Malawi Matters’ training at Mtenthera CCAP through annual financial donations. Colina de Luz Orphanage Located just outside Tijuana, Mexico, Colina de Luz (Hill of Light) is home for about 60 boys and girls. How did these children end up at this home? Some have been abused, some orphaned, some abandoned, reflecting the poverty that surrounds their family life and community. Situated on top of a hill, as the name suggests, Colina not only offers a literal and figurative oasis to these desperately needy children, but truly provides a home. FPCP supports Colina through annual financial donations and regular mission trips by members to assist in construction and care of the resident children. Veritas works with rural churches and villages to improve livelihoods through enabling a God-centered, caring approach to the management of the environment and the earth’s resources. Their goal is to enable local churches to develop a God-centered, biblically-based vision for equipping members for service and leadership that transforms their local communities and the environment holistically. FPCP supports Veritas College training at Mtenthera CCAP through annual financial contributions to the ministry. Where and When do I find out more about the NIMC? Monthly evening meetings are held on the third Thursday of the month in the Library. If you have questions concerning NIMC, please contact Kathy Bernard by email.